Traditional marketing practices grew out of the way companies managed their commercial interests. Once they determined the salient qualities of their goods and services, they used every medium available to blare that information to any person within ear- or eye-shot. As the Internet developed, companies translated those marketing materials into digital formats as well. Evolutions in marketing practices are changing how your customers budget for and spend their marketing resources. Accurate accounting of these marketing projects is critical to making appropriate decisions that will help you maintain your competitiveness in an increasingly competitive global marketplace. Marketing firms that don't account for project profitability are often wasting marketing resources and squandering opportunities. 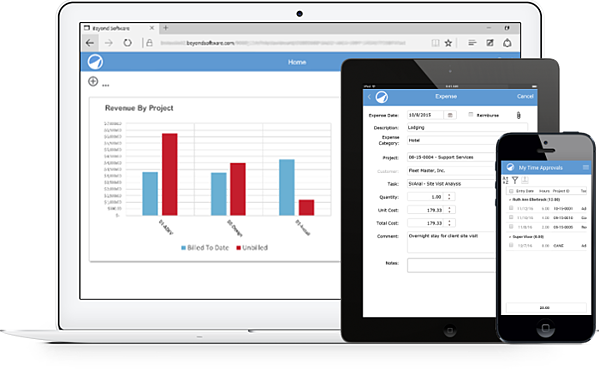 With the Beyond Software mobile app employees can capture project time and expenses as they are incurred, leading to more accurate timesheets and increased profitability. Flexible invoicing allows you to bill your clients faster with customizable invoice templates and configurable billing cycles to fit your customers' requirements. Powerful reporting and dashboards give you deeper insight into performance so corporate decision makers have the information they need to plan for future investments. Beyond Software provides the tools today's marketing professionals need to maintain their competitiveness. Beyond Software’s financials, time and expense, billing and invoicing, and dashboards and reports connect your data to provide insight across your entire organization so projects are delivered on-time and on-budget, allowing you to maximize project profitability.